Old publicity poster of the Charlie Chaplin film Festival for sale. This is an actual surviving vintage poster of the Charlie Chaplin film Festival that was organized in India by the National Film Development Corporation of India (NFDC). The film festival featured some of Charlie Chaplin’s greatest films of all time such as Gold Rush, City Lights, Modern Times and The Great Dictator. Designed, printed and circulated in India somewhere in the 1970s/1980s during the film festival, this poster was originally intended for publicity of the fest but never ended up being used. 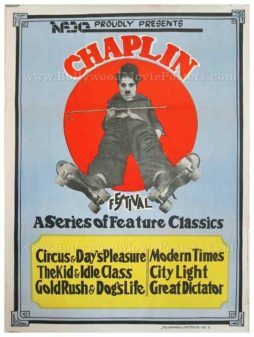 The poster features a black and white cut out photo still of Charlie Chaplin carrying his trademark walking stick, wearing roller skates. A list of his classic films which were being played during the festival appear at the bottom. Chaplin Festival marked the screening of several Chaplin classics in India, namely The Gold Rush, City Lights, Modern Times, The Great Dictator, Circus, Day’s Pleasure, The Kid, Idle Class & Dog’s Life. This poster was circulated during the National Film Development Corporation of India’s (NFDC) special release of Charlie Chaplin classics in India. Sir Charles Spencer (fondly referred to as “Charlie”) Chaplin is considered as the greatest icon of the silent film era. His “Little Tramp” character and his iconic funny walk earned him fans by the millions across the globe.